Really? I mean are you sure? It’s already nine days since my lil girl turned ONE! And I will have to wait for ONE whole year to plan her 2nd birthday party :) Alright, I will wait patiently. Of course she had a very, very Pink birthday. I put my heart into planning this one and Sara and all of us had a great time! I hope you have a great time going through this very detailed post as well. The party had to be at home (where she is most comfortable), between 4-6pm, (when she is active and fresh after her nap) and the guest list had to be small (I didn't want to intimidate her with 100 new faces). So she was surrounded by family and close friends and was a very happy birthday girl. 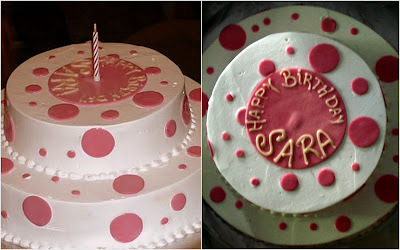 For my baby girl there had to be PINK, there had to be BLING and there had to be lots of DOTS! 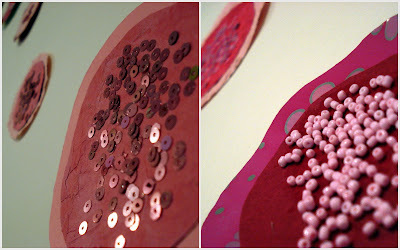 So I used lots of shades of pink paper, lots of shimmery sequins and beads and circles everywhere. 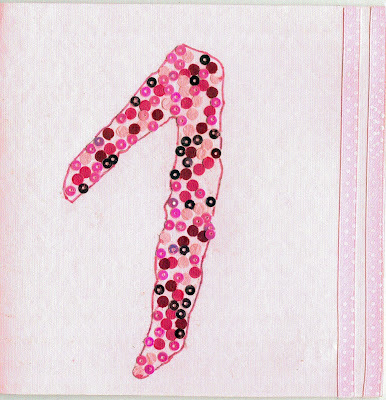 For this I used my favorite font Mistral for the “1” on the card. 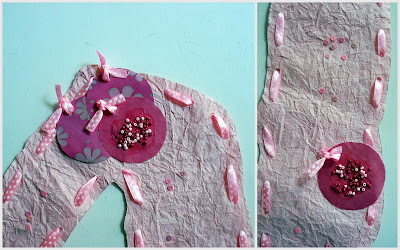 And filled it up with several pink dots punched out of handmade paper and circular pink sequins. It was laborious but worth the final product. 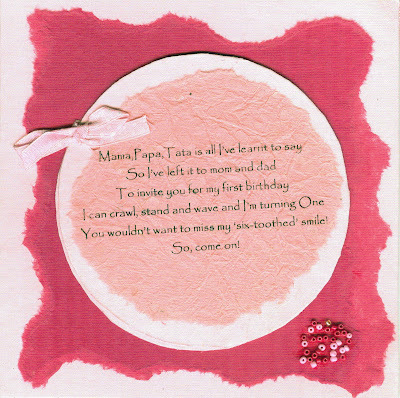 The inside of the card also had two circles carrying the birthday verse and other details. A polka dotted ribbon bow and pink beads completed it. We sent these out after the party. 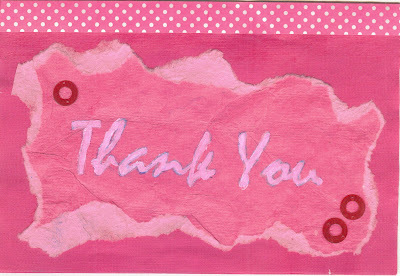 It was a simple card carrying only two words “Thank You” which were painted by hand and once again a ribbon and beads tied it up all together. This was for the main door. I loved the texture of the wrinkly paper and the baby pink color. I used the same font Mistral and cut it out by hand. Then punched several holes all along the border. Polka dot ribbon through those holes, lots of sequins and circular tags later it was on our front door. 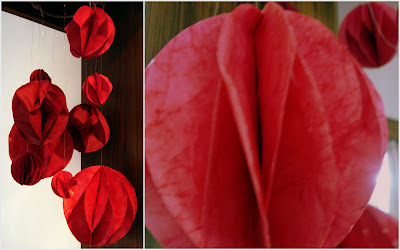 For one of our walls I wanted to do one big piece that looked girly and arty at the same time. So I cut out several circles of different sizes. On some were glued sequins, on some beads, some had ribbons. And the wall décor was ready. And there was a wishing tree. This was made with an empty biscuit tin and some branches that I picked up from the street. 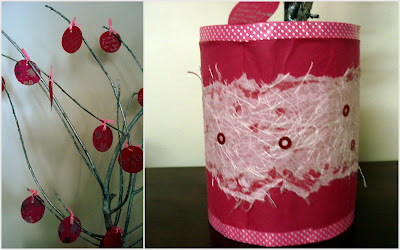 The branches were painted silver and the tin was done up once again with layers of paper and few sequins. Lots of handmade circular wishing cards and everyone was ready to wish the birthday girl years of good health and naughty times ahead. For this I followed the tutorial here, and made a pink mobile. The paper ornaments for the mobile were in different sizes and colors and Sara had fun playing with them ( As you can see from the pic;)). Finally tied it up with twine to an old silver circular frame I had. 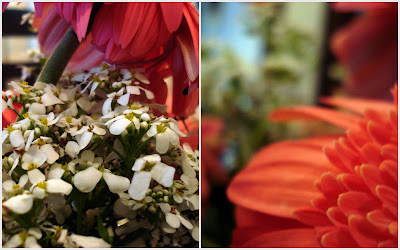 Of course the home had to be filled up with pink flowers. For this a number of ice buckets with polka dotted ribbon tied around them dressed up as vases. I also used lots of baby food jars for baby breath as well. 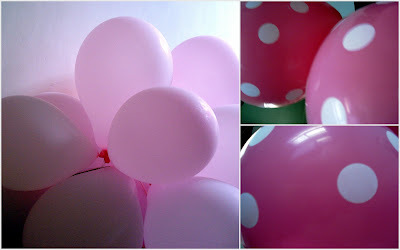 And there were loads and loads of baby pink balloons and pink polka dot balloons as well. Food placards and flowers made it all look pink. For the placards, I cut out several circles and wrote out the name of the dishes in silver. A bow in front and a bamboo stick behind and they were ready to be put inside the baby food bottles. 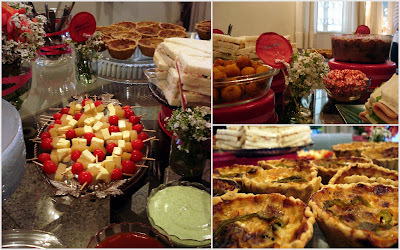 There was the polka dot pink cake and chicken and mushroom-onion quiche that I ordered. We had Alpenliebe strawberry candy (Yes, only because it’s pink and white). I made the rest at home, a chocolate trifle pudding, cocktail sticks, corn salad, chicken ham sandwiches, cabbage & carrot sandwiches, chicken nuggets, corn nuggets and cheese balls. The food was placed on a combination of bowls, inverted platters and some on inverted cake tins (that I painted in two shades of pink) to give the table a certain dimension. More on these inverted cake tins tomorrow. These were homemade chocolates (Strawberry, Mixed nuts & Butterscotch ) To pack them pretty, two large squares were cut and I tore them up slightly for the border and sewed the chocolates in them. Here’s how the final packing looked like. Phew, a long post! I had a beautiful time making everything from scratch with my paws for the apple of my eye and I really, really wish her all the happiness in the world. Happy birthday Sara! Oh my GOD! I seriously do not have words for this. I have been saying wow right from the start and it never ends. It's like this is good and then comes the next one... this is good too... and then comes the other and I am like wow... this is amazing. They are all perfect.. no I guess better than perfect. Prachi I love you. I bow down to your creativity. You are the guru... you are the best. THE BEST. I just want to keep writing about this... I can't stop watching it. I just Loved it! Loved it! Loved! it. How the hell you think like this? Where did you get these ideas from? I have never seen something so pretty. Wishing tree...how cute is that... the cake... Perfect! The chocolate wrapping... wow. I think there should be a better word then wow. It should be Prachiful... now whenever I will see something pretty as in pretty at this level I will call it Prachiful. Yes this is what any beautiful thing will be called in future. Love the wishing tree.. its impressive!! Brilliant ideas.. Well done!! And happy bday.. Sara!! super awesoeme pidly !!! like pooja said above, wish i was ur daughter !!! Absolutely brilliant! What a mix of creativity and hard work and just plain awesomeness. Most impressed. You need to go pro, my girl, there is no doubt about that. considering Im learning from the best...this is what your blog taught me to do for arhaan's. What a great spread on the table. If you still have any doubts about going professional, puhleezeee throw them out of the window! 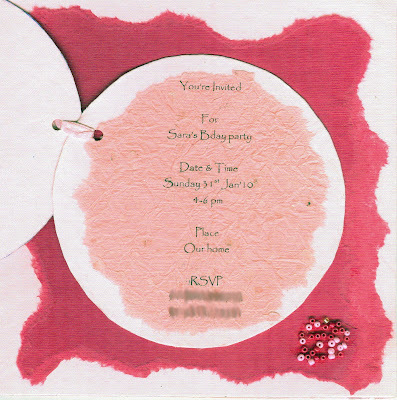 This post is our 'pink-proud' moment...I oh-so-love each bit of it...from the sequins to the ribbons...from the invite to the favors...from the detailing to the final 'pink'astic...err...fantastic result!!! !You know when is my birthday, right? I was actually there everyone!!!! Most fascinating and awesomely pink. KP : Great to see you here, thanks. Aneela : Hey,lots of good wishes for Arhaan. I checked out the post...super impressive..thanks for the good words. W.O.W! Everything looks elegant and pretty. Great job! Happy Bday Sara! Wow - just breathtakingly beautiful!!! I am into scrapbooking, cardmaking and all sorts of stuff...but never seen anything this beautiful! And to do it all yourself with a baby hanging around you - how do you manage that!!!??? I am sure you are a professional and if you're not you really need to be. BTW my first time here - came over from Parul's blog. I just stumbled across your blog and I think it is super.. I am completely hooked. I just loved the way you put together stuff for your daughter's bday simple yet so beautiful. Now am busy going through your earlier posts. Keep up the good work. Awesome. I have a lot more adjectives to add, but right now I just want to go back and read your post again:) Loved the torn paper with buttons and ribbons sewn on top..super idea! Divs : Wow! please please share your projects with me..i would love to share it everyone! Welcome to purplehomes..keep coming back. Suneeta : Thanks a ton for such an awesome comment! I am so glad you are enjoying it! SMM : Welcome! Happy to hear that you liked what you saw here ;) Don't you worry, even if you have a baby boy we will do up an inspiration board especially for your little brat ;) In the meanwhile i hope you have a great time here! Thatz so beautiful! U r so creative!